There are few forms of bronchogenic carcinoma based on its histological patterns. These includes squamous cell carcinoma, adenocarcinoma, small cell carcinoma, large cell carcinoma and metastases of other form of cancer/carcinoma. Other forms of tumor such as liver, adrenal, brain and bone may metastasis to the lung. Squamous cell carcinoma is commonly present at the central of the airway. Histologically, there will be squamous cells and keratinization. 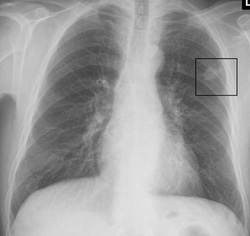 Chest x ray may reveal hilar mass with cavitation. Squamous cell carcinoma may present with hypercalcemia . Large cell carcinoma may present with peripheral growth of mass/ tumor in the form of large polygonal undifferentiated cells. Adenocarcinoma is another form of bronchogenic carcinoma. There are two forms of adenocarcinoma such as bronchioalveolar forms which consists of columnar epithelial cells along the alveolar wall and mucinous nodules. Another form of adenocarcinoma is bronchial form which consists of mucin cells and glandular elements. Bronchial adenocarcinoma typically develop in the scar sites. Small cell carcinoma develops on the central of the airway with the present of oat cells ( small round basophilic cells ). Other form tumor include pancoast tumor which is an apical lung tumor that leads to Horner syndrome which consists of ptosis, miosis and anhidrosis as a result of cervical sympathetic plexus involvement. Bronchogenic carcinoma may present with symptoms and signs such as shortness of breath, chest pain, loss of weight, recurrent laryngeal nerve palsy ( hoarseness), pleural effusion, facial swelling, dilation of veins of the upper limbs and head ( superior vena cava syndrome), Lambert- Eaton syndrome ( myasthenia gravis illness common in small cell carcinoma) and Cushing syndrome ( ACTH production) and SIADH. The common causes of bronchogenic carcinoma are smoking, radiation, asbestos, air pollution and nickel exposure. The treatment of bronchogenic carcinoma may include surgery, radiation and chemotherapy.